2 types of hearty bread, browned sausage, onions and celery meet up with bite sized apples, dried cranberries and spices. 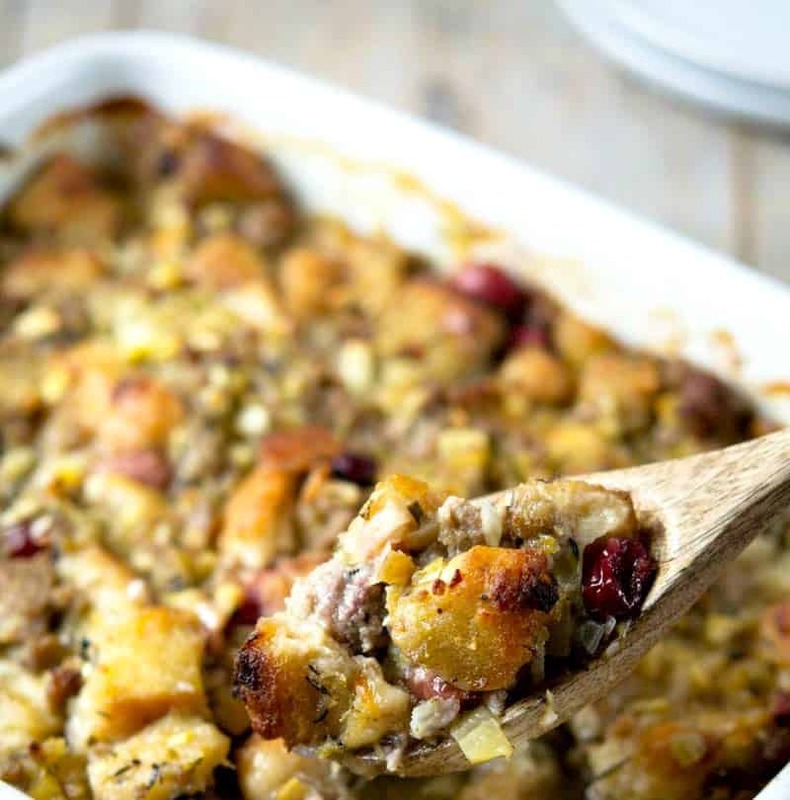 Baked or stuffed, this stuffing is a winner! I know how hard wired traditional family recipes can be. Straying away from your grandmothers stuffing can be difficult, if not impossible in some families. If it reassures you in any way, I have been making this stuffing for over 10 years now, maybe even closer to 15. 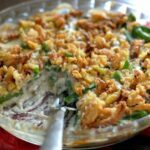 I’m not expecting you to all of a sudden give this recipe a whirl while you have 18 very “hAnrgy” people waiting in your living room at 4:00 on Nov 22nd. But what I will say, is this stuffing recipe is a TRIED AND TRUE recipe. If you don’t give it a try on the most stressful holiday of the year I understand. But just give it a try. This is where the ‘unprocessed’ part of our site kind of goes out the window. Sorry. I hope you’ll forgive me. But this is tradition we’re talking about here. WHITE BREAD – forget the Wonder or the lower priced breads. They will become pure mush. You will need a hearty, thicker white bread to stand up to the chicken broth. WHOLE WHEAT BREAD – same idea. Skip the $1.00 bread and get something hearty. 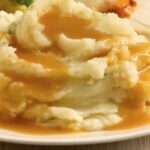 PREP – About 4 or 5 days before Thanksgiving I sit down on the couch with a very large roasting pan or a store bought aluminum pan and I start breaking up the bread into smaller pieces. I place the pan in a warm place, usually on top of my fridge or in the oven. Just remember it’s in there! Every few hours, or when you remember, give it a good stir allowing the bread to become stale. Again, every day or so continue to break the bread down into all different sized pieces. Do you have to do this? No. I’ve read online you can bake the bread. I have never done this. This is just the way I’ve always done it. 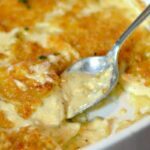 The stuffing begins on the stove, but finishes up in the oven or your turkey, sometimes both. Into a very large skillet will go the butter, onion, and celery. 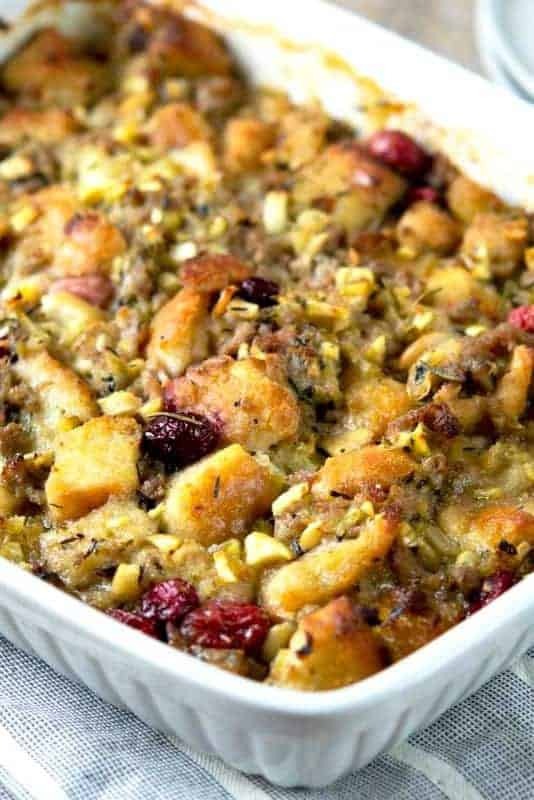 This is the flavorful base of the stuffing and will get the party started. Remember to season at every step. Just a little salt and pepper goes a long way. Next to the pan is the sausage. I use SAGE sausage. If you absolutely cannot find it, then you can add dried sage at the end, but it is worth trying to find it. As it cooks, break it up into very small pieces. Add the spices and stir to combine. Getting the spices into the pan BEFORE the liquid allows their oils to be released. Next to the party are the apples, cranberries and more butter. To be honest I think I’ve used every apple imaginable. This stuffing recipe is super forgiving so if you hate Granny Smiths then don’t use them. Just be sure they are diced very small. Add the chicken stock and give this all a nice stir. The sausage is nice and browned, the apples have slightly soften and released their sweet juices, the spices will continue to blend through. Take this off the stove and pour it over the stale bread. Have a little reserved chicken broth waiting on the sidelines in case you need it. Stir – stir – stir ! One of the reasons I think this stuffing recipe is so successful is the size of the ingredients. You want each bite to contain a little of each ingredient, so if the apple is too large, or the sausage is too large, that’s all your guest will taste. It is a perfect melody of flavors and balance. This stuffing can of course be placed inside the turkey, which is where most of mine ends up. However, if you are not planning on stuffing a turkey it can be baked so the recipe you see below is with the intention of this stuffing being baked. If you are baking this, PLEASE keep a watchful eye on this. If you are using a store bought aluminum foil pan this can easily burn as it is very thin. Even the rack you put it on will have an impact. Take the stuffing out every so often and stir it. If it needs more liquid, add some stock. The important take away is don’t let it dry out too much or it will burn.